A deficiency in the essential omega-3 fatty acids is nothing to take lightly. These fats are not only critical for a healthy immune system, but they also play key roles in preventing serious health conditions. A deficiency leaves us vulnerable to arthritis, asthma, heart disease, hardening of the arteries, certain cancers, high cholesterol, high blood pressure, chronic fatigue, mood disorders, skin disorders, and more. To get this protection, we not only have to increase our omega-3 consumption, but we also have to limit our omega-6 consumption. For an explanation on this balancing act, check out the general information about the omega fatty acids. So what are the best sources of the healthful omega-3s? I can already hear you making yummy noises! Okay, so perhaps it’s not the best news you've heard all day, but we can get what we need through supplements if necessary. Let's start with information on the more stinky of the two choices above. Cold-water fish and fish oil supplements contain two of the three essential fatty acids found in omega-3s – EPA (eicosapentaenoic acid) and DHA (docosahexaenoic acid). Quite the mouthfuls, so it's no wonder you'll usually see them in their abbreviated forms. They keep blood platelets from sticking together and forming clots that can cause heart attacks. They help keep triglycerides levels low (especially when one reduces sugar and unhealthy carbs in the diet). They also reduce all kinds of inflammation, including autoimmune disease and irritable bowel syndrome. While fish and fish oils contain EPA and DHA, flaxseed and its oil contain the essential fat ALA (alpha-linolenic acid). ALA also has the ability to boost your immune system, stop out of control inflammation, and guard your cardiovascular system. Flaxseed oil just doesn't work as fast as the fish oils because the body has to convert the AHA into EPA and DHA (which takes weeks). 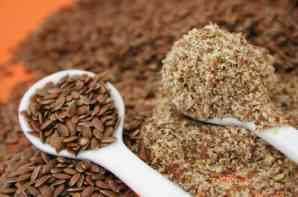 Besides taking the oil, you can also benefit from the flaxseed itself. It provides an excellent source of fiber, contains compounds that balance out your hormones, and fights off excess estrogen that can cause cancer. There are a few things you should be aware of before actively seeking these fats out. If you are going to take them in supplement form (oils), buy the ones that are in dark bottles and are kept refrigerated (health stores would probably be your best bet). These oils are fragile and degrade when exposed to heat or light. To protect yourself from any degradation in your body, make sure to take these oils with around 400 IU of vitamin E.
Flaxseed oil should be bought organic and fish oil should state that it is free of mercury, PCB's, and other contaminants. Ideally an independent laboratory should be doing the testing. If price is a concern for you, buy flaxseed oil. It is much less expensive than fish oil and you will end up with the same benefits. If you wish to simply eat more cold-water fish, stay away from the ones with high levels of mercury like shark, swordfish, king mackerel, and tilefish. For more information on which fish are safe to eat, check out this EWG article – Eating Fish: There's a Catch. A more specific list of safe and unsafe fish can be found on EWG's Fish List.